If you're a fan of the series Game of Thrones, you'll get the reference in the title of this post. I'm currently in the midst of the Game of Thrones re-watch in preparation for the final season which airs on April 14th. I'm only 3 episodes into Season 3, so I've a ways to go and I realize I may not make it all the way through 7 seasons in 3 weeks. I've had many favourite shows over the years (Deadwood, Six Feet Under, Hannibal, Veronica Mars, Penny Dreadful, Buffy the Vampire Slayer, etc) but I haven't felt as deeply invested in the outcome of a series as I do with Game of Thrones. Instead of going off on a long-winded rant of why I love the show, I will move on to the subject of this post. 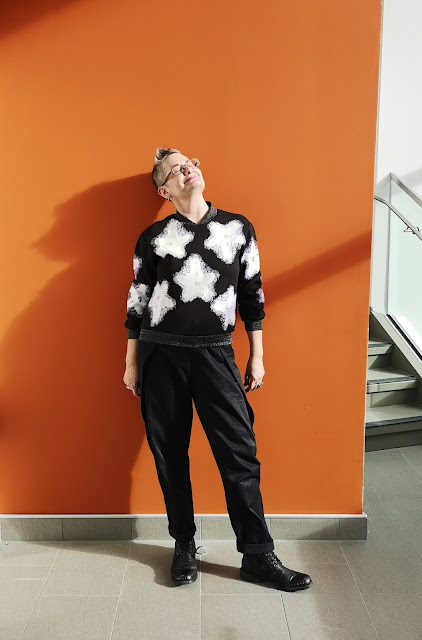 I used to think I wore a lot of black in my early adulthood, but when I look through old photos, I see that aside from my favourite skinny black jeans, I wore quite a bit of colour, so perhaps it was just my attitude that was dark? 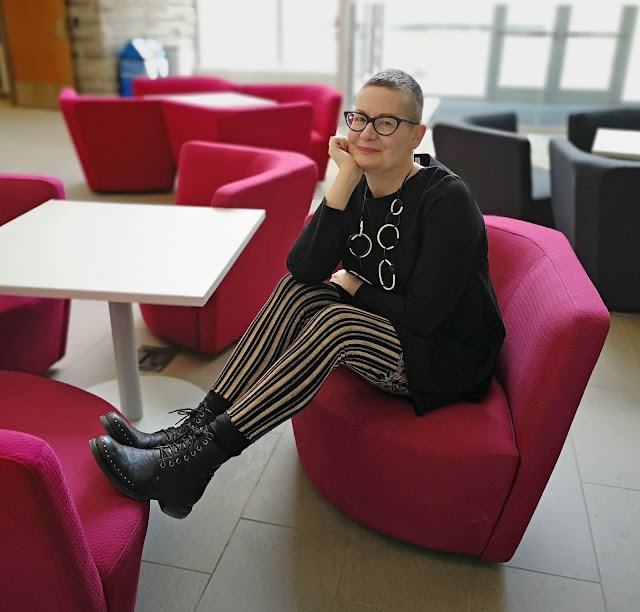 I had a few years in my 30's during which my mother would ask me "Do you own any other colour aside from black?, which must have been during my "I need to wear professional work clothes" phase as I transitioned from retail jobs to office work. I remember having a temporary job in an accounting firm with a strict dress code, and everything I wore during the two months I worked there was black. In my 40's I embraced more colour, which may have coincided with my more mellow emotional state. I loved colourful vintage pieces from the 80's and I had a couple of floral print jumpsuits that I wore in the summer. But by the time I turned 50, I was slowing drifting back to the dark side. More pieces of black clothing crept into my wardrobe, and when I went thrift shopping, I always looked at the black pieces first. The colourful pieces were sold or donated. Every time I was just about to take another piece of black clothing home, I would stop myself, and say "why don't you get something in a bright, or lighter colour?" The answer would always be, "because I feel good in black". 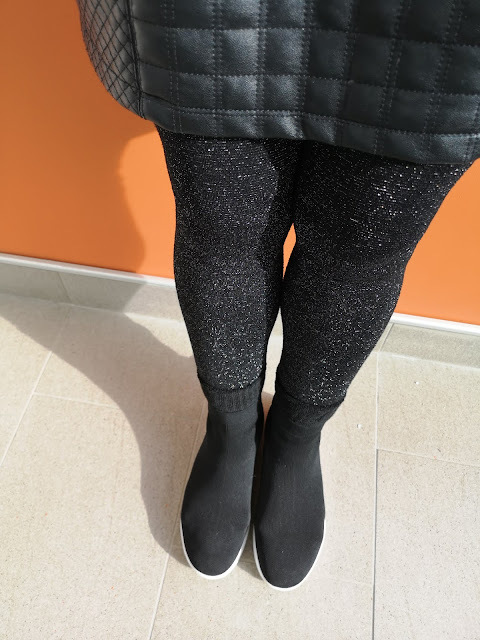 Black can be rather boring if you don't pay attention to shape and texture and if I am wearing head-to- toe black (which isn't often), I will make sure there's some visual interest with different fabrics. I don't think my fondness for black has anything to do with it being a supposedly "slimming colour", mind you, I did start gaining weight in my 50's. I think it has more to do with embracing a tougher and slightly more punk feel to my style, which suits my greying hair, which I've stopped colouring in the last few years. It isn't a seasonal thing - I wear just as much black in the summer as I do in the winter. The late street photographer Bill Cunningham was quoted as saying "Fashion is the armor to survive everyday life" and I feel like black is my personal armor. 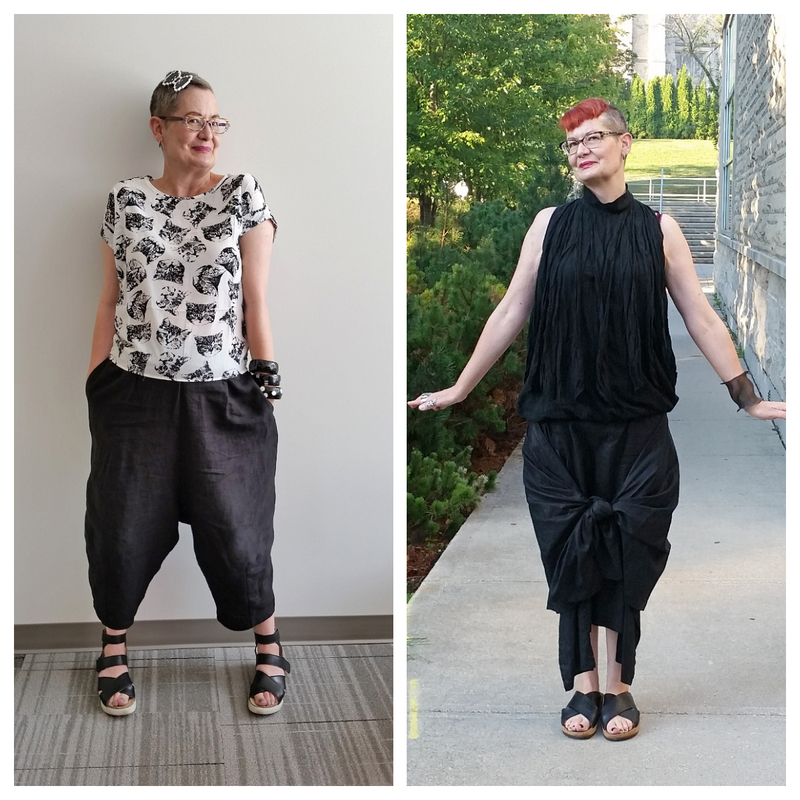 I've watched many of my blogging friends (Melanie, Vix, Suzanne, Sheila) happily embraced bright colours and patterns, while I feel more like a crow amongst birds of paradise. I will add blue or grey, or even a bit of red now and then to break up the swath of black, but the foundation pieces of my wardrobe are black, and when I shop for clothes, I always look at the black pieces first. 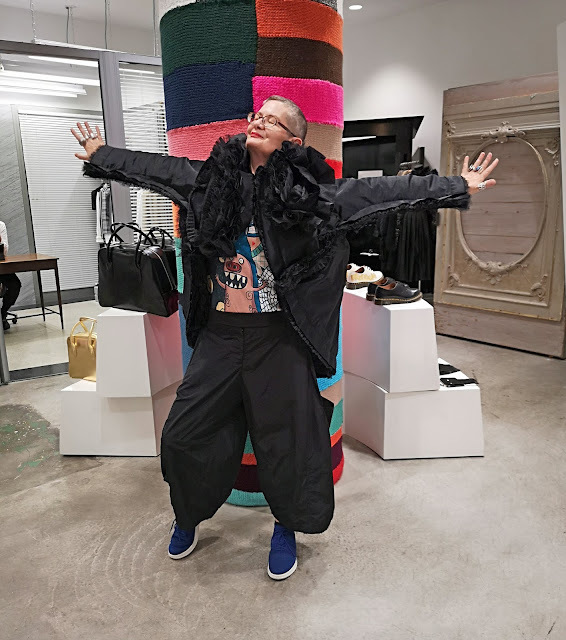 When I was in New York in the fall, a friend took me to the Dover Street Market, which carries cool high end brands like Comme des Garcons and every piece I tried on (and loved) was black. The background of the top I'm wearing above is actually dark blue, but looks black here. I look so blissed out because this was one of the few sunny days we had this winter. 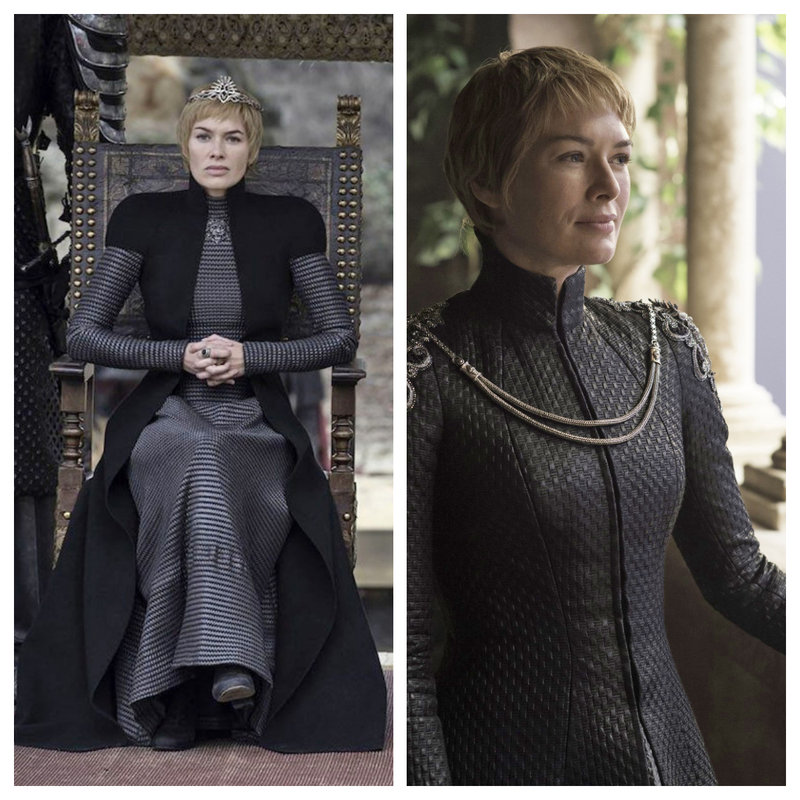 As the series draws to a close, all of the strong women end up wearing black, including the reigning Queen, Cersei Lannister, who is a nasty piece of work. The colour suits her. However, the "good guys" in the series also adopt a much darker wardrobe as time goes by. 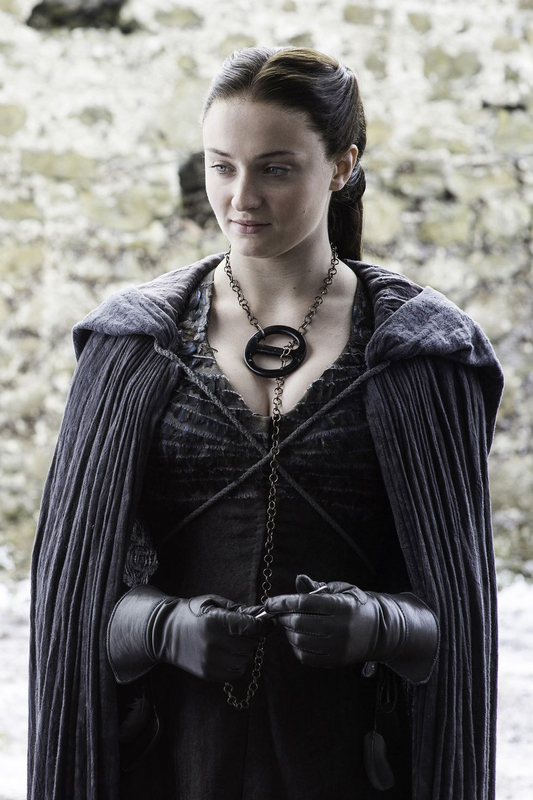 Sansa Stark, currently the Lady of Winterfell, is all grown up and has abandoned the soft pretty colours she wore in the first few seasons of the show. I had to end with this photo of one of my favourite characters - 10 year old Lady Lyanna Mormont, who is wiser, and braver, than many of the other much older characters. And of course, she is always dressed in black! Do you have a lot of black in your wardrobe, or do you take a more colourful approach to dressing? You look amazing in black! 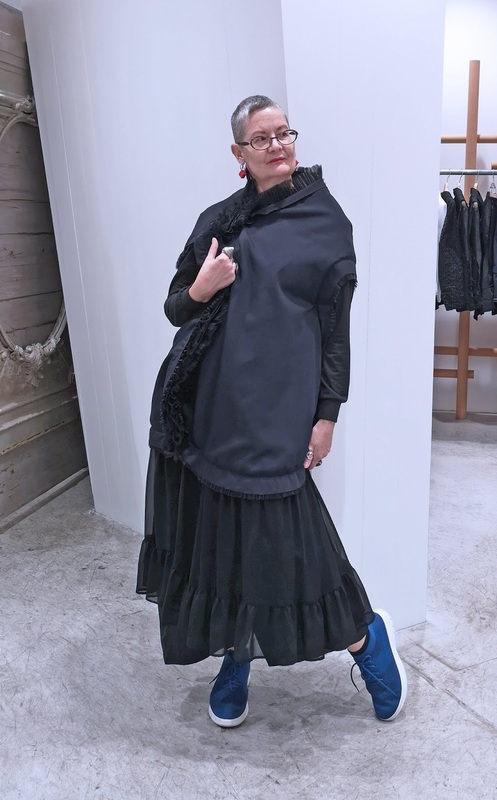 Your pieces are carefully considered and beautifully constructed and because of the artful way you put your outfits together I don't think of you as a woman who mostly wears black just as a fabulously dressed person I'd happily hang out with. I love you in that black lipstick and that Comme des Garcons gear is incredible (I've got a friend who lives in it and the construction is out of this world). 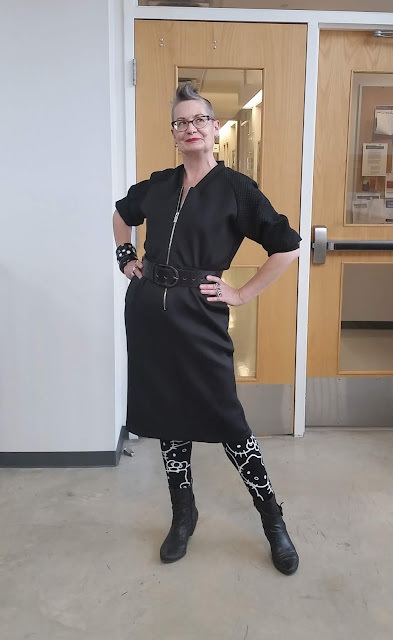 Like you, I was often asked if I owned anything that wasn't black back in the 80s - it was a uniform for me, a way of saying that I was anti-fashion, anti-mainstream and liked alternative music - now people still recognise that I'm a bit different just without the dark wardrobe! I think you would like Game of Thrones - there are a number of strong women characters (who unfortunately, pretty much all get treated badly until they realize their own strength and abilities), plus there are dragons! I wish I could afford a whole wardrobe of Comme des Garcons pieces, but in lieu of that, I try to find similarly interesting pieces secondhand. I love your black outfits - I was thinking of you this past weekend while I was out shopping (as I saw a bunch of Comme des Garcons in Turnabout in Vancouver). I find myself gravitating towards black and white, as well as other neutrals, these days. But you'll have to pry me away from my colour! I liked seeing your list of favourite shows there: Penny Dreadful was awesome, wasn't it? I am also a big fan of Deadwood and Buffy (and Angel). I'm so excited for the last season of GOT!! Hey, by the way, I'm planning on being out in Hamilton in early July (5th-7th-ish) - if you can, I'd love to try to meet up! I'll be visiting my dear friend Elaine (also an artsy, funky older chick like us) for a few days. Will drop you an email closer to then, but planting that seed if you're interested (and I'm totally cool if you're not). I adore all your black! And I think of black as a powerful color, not dour. 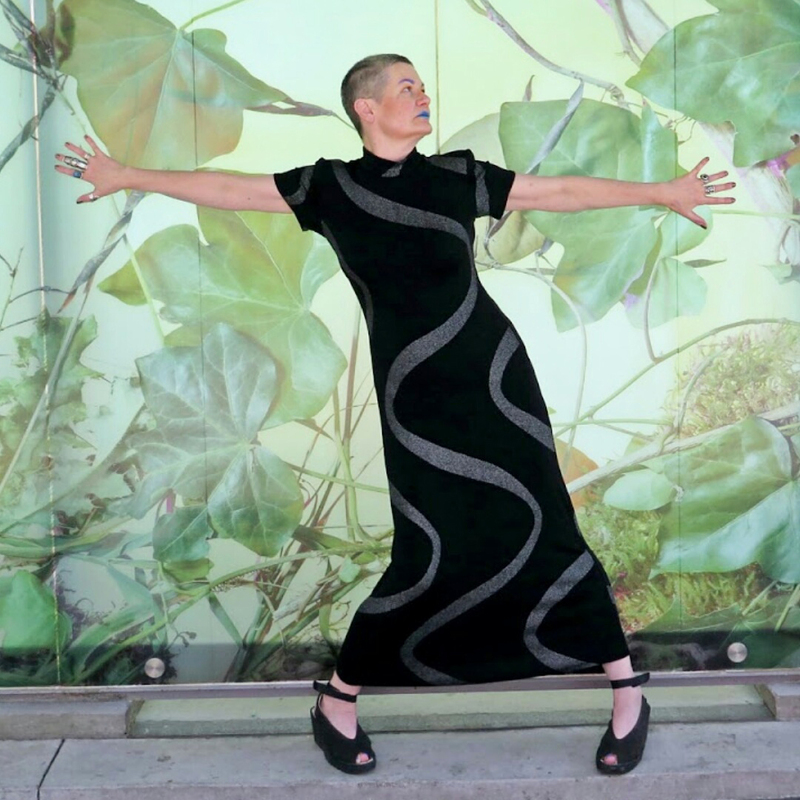 When I want to feel really grounded in my own power at work, I make sure I am wearing more black than not. . .Like you, I love my pops of color with black. 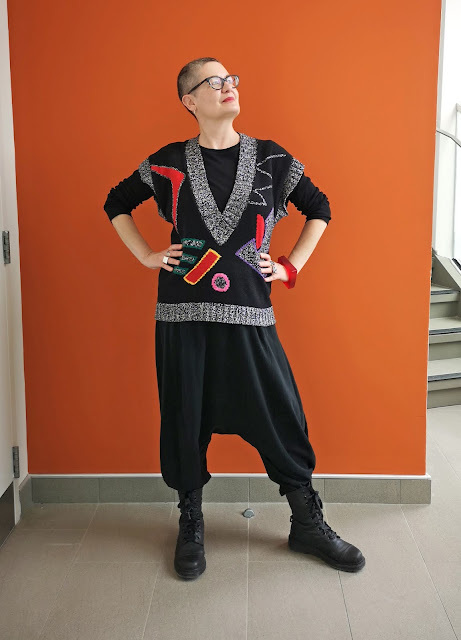 And sometimes I really am not in the mood for dark shades, and find myself relying on indigo and burnt sienna, or pink, or red, or green. . .Eclectic is one of my personal fashion directives. But in the end, black is the best anchor, in just about every way. You showcase your black so well. I think the fact that you always choose unique designs and textures helps to break up the black. I'm not a huge fan of black but I do wear it sometimes. I think you've influenced me a bit over the years. One of the black dresses I bought was because I thought it would be something you would wear and in the end I really liked it on me. Goes to show one should always have an open mind. I don't necessarily think of you in black but in clothes of varied shapes and textures - the black sometimes seems secondary. And you always have great hair and accessories. I love black sometimes, with intensity. And then I don't, with intensity. Hahaha. You certainly look fabulous in your clothes because you OWN them. I agree that black is a power colour. Of course you are drawn to it. Actually, your clothes are so interesting and cool and have so much personality and attitude that I don't even consider their color, just their shape or how cool you look in them, totally fabulous! I like black, even if not feeling like wearing it head to toe anymore (as I used to do!) but still a powerful color for me (my heart beats faster when I watch a black maxi dress!). Now I've realized that I prefer it with white or into geometric prints, but it will be a favourite of mine! Why do I wear black? They haven't invented a darker colour yet! 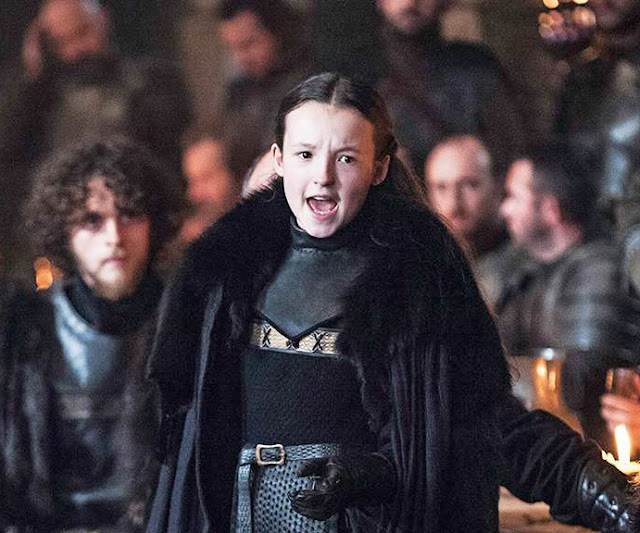 I love Lady Lyanna Mormont - she cuts straight to what everyone is thinking and I hope she survives.